Five years after Graham Hopkinson passed away, Premier’s Gerard King is at the Hopkinson’s helm. The Hopkinson’s office building now has memorials to Graham, and the staff have fond memories of him. Veteran Sydney bus operator Graham Hopkinson sadly passed away in September 2011, but thanks to a helping hand from one of his peers his company has remained sturdy. 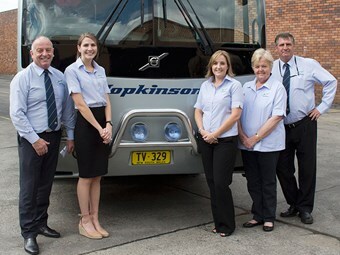 Gerard King, managing director of Kiama Coaches (and one half of the King brothers who run Premier Transport Group, the other being John), is now also managing director of Hopkinson’s Transport. For a couple of years, a second generation of Hopkinson’s was in charge of the business, but they decided it wasn’t for them and wanted to pass it along. Hopkinson’s is now part of Premier, and is linked with Kiama, though the operation still retains its name, brand and the majority of the workforce who had been around for much of Hopkinson’s previous success. Gerard King says it would have been a shame to change the Hopkinson’s name, as it was a brand which had been built up over a great deal of hard work. "It’s a brand that was built up over many, many years, it’s got a lot of respect," he says. King says most of the changes he has made have been operational or administrative, as some of the second-generation Hopkinsons who took over didn’t quite have the experience to run the company to its full potential. "The core staff I’ve kept have been long term here," he says. "The workshop and operations manager has been here for 36 years. "The general manager has been here for 18 years." In one form of another, Hopkinson’s has been for around for about 90 years. Previous to becoming Hopkinsons’s Transport, the business traded as Merrylands Bus Service, which was formed by the Try family in 1923. Since taking charge of Hopkinson’s, King has been making moves to expand the charter side of the business, with a focus on tour packages. "We want to get back to tours – at the moment we’ve been focused on schools," he explains. "We’ve had a lot of success with schools through our Travelways product which is managed by only one person." The Travelways brand serves a few hundred schools each year, and looks to be becoming more and more popular as it grows. "Teachers are there to teach – not set tours up … and that’s why they come to us," King says. The Hopkinson’s office building now has memorials to Graham, and the staff have fond memories of him, though King already has the respect of his team, likely due to his own admiration for his predecessor. Read ABC’s obituary to find out more about the man behind the Hopkinson’s name. To read the full story see the October issue of ABC magazine. Click here to subscribe.